“One evening, [in the summer of 1914] sitting round the fire, we suddenly became serious. Hugh Popham said that he was glad the war had come, and particularly glad we had come into it. I do not know what the others said, but everyone there was in agreement with him. I remember my reply clearly. I said it was criminal to welcome war; that millions of men would die, millions who had no quarrel with each other and could know nothing of the quarrel in which they lost their lives and all the belligerent contries would suffer ruin, whether they won or lost. I poured out my views on the futility of war, thinking of Tolstoy and War and Peace. I said we were fighting to preserve the Tsar’s Government in Russia, in an attempt to postpone an inevitable revolution. Suddenly I had said all that was in me and I heard Hugh Popham make some comment in a tone of nausea. But I believed that whatever the impression I produced, in the long run what I had said was true, that I was right and that Hugh and the others were wrong. He initially thought of helping on the medical front. Geoffrey Keynes had joined the Royal Army Medical Corps, and David offered to go out with him as a dispenser or a bacteriologist, or even as his batman. “The whole concept of military organisation was entirely unknown to me and had it been explained it would have shocked me profoundly to learn that, at the beginning of the war, enthusiasm would not open all doors in the British Army. I never imagined that my idea of joining a field hospital at the last moment, without training, was fantastic. Nor, I think, had Geoffrey” (Golden Echo 270). David then talked to Geoffrey’s older brother, John Maynard Keynes, who was convinced, on economic grounds, that the war would be over in a year or so. Keynes was so persuasive that David went on believing him until well into late spring 1915. Volume 2 of Garnett’s autobiography, The Flowers of the Forest, begins with a general comment on war: the result of long meditation, since this volume was not published until 1955. War is the worst of the epidemic diseases which afflict mankind and the great genetrix of many of the others. While it lasts it impairs the power of rational judgement; millions are crippled and die and the accumulated riches of empires are destroyed by fanaticism and fear; cruelty and callousness are infectious and these toxins of the spirit make the unconscionable claim that all personal life, happiness, art and human expression must be subordinated to war, or serve it (p. 1). He describes the four years as the ones in which he grew up, and gained courage and self-confidence. Because he did not fight, in the last two years “I was regarded with contempt and aversion by many people, including a few of my oldest friends” (1). It did take a while for his pacifism to develop. His friends, like Rupert Brooke, were joining up. He was clear-headed enough to realise that many of the stories of German atrocities in Belgium were lies. And yet that didn’t matter: “it was an atrocity that they should have invaded Belgium at all” (2). He was sympathetic to D.H. Lawrence’s wife Frieda, who came to dinner at 19 Pond Place (off the Fulham Road), and talked about her cousins, the von Richthofens, and her sister, who had married the aide-de-camp to the German Crown Prince. (In the days that ensued, Garnett had five detectives visit him, separately, to ask him about his German contacts.) 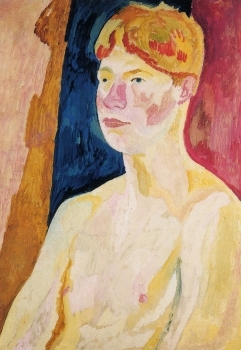 It was at that time too that Garnett became close friends of Clive and Vanessa Bell (Virginia Woolf’s sister) and was frequently at 46 Gordon Square; and he became close to the artist Duncan Grant, “the most entertaining companion I have ever known” (29). His life seems full of social engagements (including dinner with the Prime Minister and his wife) until April 1915. By then it was clear that Keynes’s prognostications about the shortness of the war were wrong. Garnett discussed the possibilities with his mother Constance: joining the Quakers (and the Friends War Victims Relief Mission); getting a job as a bacteriologist; training as an army officer; working in a factory. At that point he had no conscientious objection to joining the army; but Francis Birrell persuaded him to come with him into the Friends War Victims Relief Mission.They went to France together in June 1915. The Quaker base, the Mission Anglaise, was in Sermaize-les-Bains (Marne), which had been largely destroyed by the Germans in 1914. From there they were sent north to Nettancourt, where they were going to help restore Sommeilles, another village largely in ruin. He and Frankie were sufficiently Quakerly to “develop a concern” that they should live in Sommeilles itself (this was largely to get away from the other Quakers, who—reading between the ones of his autobiographical account—disapproved of the closeness of relations between him and Frankie). Among the visitors they had in Sommeilles were Barrow Cadbury (a very senior Quaker); Sir Augustine Birrell (Frankie’s Cabinet Minister father); and J.M. Barrie. Garnett worked very hard while Barrie was there. “If our visitor had been an author whose work I admired, I should have been less of a disciplinarian… I disliked Peter Pan as a child and when I grew up it seemed to me morbid and unhealthy in a particularly unpleasant way” (84). The small world in which Garnett lived is nicely illustrated by the fact that, by accident, he was staying in the same Parisian hotel as Jane Harrison (the classicist) and her friend Hope Mirrless (who would later write the classic fantasy novel Lud-in-the-Mist). Harrison had known Garnett’s mother at Newnham College, Cambridge. By November 1915 it seemed unlikely Grant would ever get to Paris, and Garnett returned to Sommeilles for a while. He spent Christmas at nearby Châlons, at the invitation of Dr Hilda Clark of the Maternity Hospital there. But friends were pressing him to return to England, and in January 1916 he stayed at Asheham, on the South Downs of Sussex. It was one of Virgina Woolf’s favourite spots, and Garnett found himself back with Vanessa and Clive Bell, Lytton Strachey, Duncan Grant and others. “Much of our talk was about the prospects of the bill introducing conscription” (104). Clive Bell had been asked by Lloyd George to be on a committee to devise safeguards for conscientious objectors. Garnett was by this time a convinced pacifist, and believed that (however awful the Germans were) a peace should be made to avoid a prolonged war that would be disastrous for Europe. Soon after the Asheham holiday came to an end, compulsory military service was indeed introduced, and Garnett, Grant and other Bloomsbury friends started working for the Council for Civil Liberties, one of the organisations dedicated to its repeal. Maynard, who was now senior in the Treasury and party to many secrets that he could not discuss, advised Grant and Garnett not to hang around London (engaging in activities that were regarded as unpatriotic) but to plan for exemption from military service by working on the land. Grant rented Wissett Lodge (near Southwold in Suffolk) and he and Garnett planned to be fruit farmers. They sold flowers, they raised a flock of hens, they cultivated the orchard. When Garnett told an old family friend, Godwin Baynes, a Major in the Royal Army Medical Corps, what he was doing, he was shocked at the reply: “Have Rupert and Nurse Cavell died in vain? I spew you out of my mouth… (119). Baynes was the first of many friends that Garnett lost through his pacifism. The tribunals for conscientious objectors began. Lytton Strachey’s case came before the Hampstead Tribunal, and was the occasion of his famous response to the question of what he would do it his sister was being raped by an Uhlan. He looked at his sisters (who were there with the whole family) and said “I should try to interpose my own body.” Grant and Garnett appeared before the tribunal at Blything in Suffolk; their case was presented badly, and so they had to appear before the Appeal Tribunal in Ipswich. Maynard Keynes took charge, wielding a large locked case with the royal crest on it, saying that he had to be back at work on the utmost national importance in the Treasury as soon as possible. Both Grant and Garnett were given leave to appeal. They had to fill out long questionnaires about their attitudes towards warfare. Garnett’s line was that it was wrong to subordinate one’s private judgement to another, as a soldier had to do. He heard later that although Grant had been exempted fairly easily, his own case was more difficult, and it was only the fact that he had worked in France with the Quakers that counted for him. The tribunal decreed that both of them had to do work of national importance; i.e. farming. But the tribunal declared that although the Wissett Lodge project was no doubt doing good work, they could not trusted to be self-employed. They decided to leave Suffolk, and preferably to go and work near Leonard and Virginia Woolf, who were living in Asheham. Vanessa Bell found and rented a farmhouse called Charleston in Sussex. It was empty of furniture, but items were brought down from Gordon Square, and, to Garnett’s dismay, “both Duncan and Vanessa appeared to believe that the inherent horror of any badly designed piece of furniture could be banished forever by decoration. The strange blend of hideous objects of furniture, painted with delightful works of art, gives to the rooms of Charleston a character which is unique and astonishing” (125). Judging by Garnett’s own account, the farm work was no easy option. They decided on a seven and a half hour day, but thanks to the submarine blockade, the lack of fat and sugar made hard manual labour difficult. Garnett became strong and fit; Grant found it much more difficult, and in the second year was given medical exemption from working except in the mornings. Even though he was physically fit, Garnett found it a mental strain, and found his temper very difficult to control. “I came to believe that the war would certainly go on for another ten or twenty years” (132). “As the war went on, I found that I could cope physically with the farm work and I became indeed a skilled labourer. At the same time I became more and more of an automaton” (140). Early in 1918, Grant got hold of a copy of the catalogue of the sale of Degas’ collection of paintings in Paris. Maynard Keynes dropped in in March 1918, on his way back from a finance conference in Paris: he had a Cézanne in his suitcase. He had also bought four pictures by Ingres, two by Delacroix and two by Manet, and (his main objective) had secured a large purchase of paintings for the National Gallery. Shortly afterwards, Maynard had a row with Vanessa in Gordon Square about conscientious objection. He came down to Charleston to make amends; and this time it was Garnett’s temper than ran away from him, a realisation of which sent him at times into “blackest despair”. Occasionally Grant and Garnett got up to London. Once they went to the opera during an air-raid. The conductor—I think it was Sir Thomas Beecham, laid down his baton, turned to us and said: “Will any members of the audience who wish to leave do so now. The company and I will then continue.” Not more than half a dozen people scurried out while we applauded and the opera was concluded with noises off. When we came out we found that the last wave of Gothas had passed and that Southampton Row was full of fire engines. As usual the bombs aimed at Euston, St Pancras and King’s Cross had fallen in and around Queen’s Square (183). After a holiday in September 1918, he returned to Charleston, and enjoyed himself ploughing with a new tractor. In the first days of November, “a wild excitement spread” (189) as people realised the enemy was cracking. As soon as news of the armistice arrived, Grant and Garnett pedalled furiously to get the train to London and to join in with the celebrations. There were more than the usual number of motor-buses—in some places the roads were blocked with them. They no longer ran on their accustomed routes, but loaded with a full and permanent complement of cheering passengers, they explored new neighbourhoods, such as the squares of Mayfair and Bloomsbury, at the whim of the driver. Every taxi had half a dozen passengers inside and a couple more on the roof (189). “I suppose you think that the war is over and that we shall go back to the kind of world you lived in before it. But the war isn’t over. The hate and evil is greater now than ever. Very soon war will break out again and overwhelm you. It makes me sick to see you rejoicing like a butterfly in the last rays of sun before the winter. The crowd outside thinks that Germany is crushed for ever. But the Germans will soon rise again. Europe is done for; England most of all the countries. This war isn’t over. Even if the fighting should stop, the evil will be worse because the hate will be dammed up in men’s hearts and will show itself in all sorts of ways which will be worse than war. Whatever happens there can be no Peace on Earth” (190-191). It was the last time Garnett saw Lawrence. Garnett and others went to Trafalgar Square, and joined in the general dancing; he danced with Lady Mond. Canadian soldiers had made a bonfire of hoardings, against the base of Nelson’s Column. Garnett ended the evening in 46 Gordon Square, leaving early the following day for the farm. “When I thought over the events of Armistice Day it seemed to me rather an odd augury for the future that I should have begun it as a slave engaged in forced labour, and before its close should have been dancing with the wife of a millionaire Cabinet Minister in Trafalgar Square” (192). Garnett and Grant went back to the farm, but did no work; and they gradually drifted back into the social life of London. He helped Vanessa Bell with her new baby, as Clive Bell was often away; indeed, he was present at the birth of Helen, later renamed Angelica, on Christmas Day 1918. Garnett wrote to a friend shortly afterwards, “I think of marrying it [i.e. Angelica]. When she is 20, I shall be 46—will it be scandalous?”. (When Angelica was in her early twenties, they did marry (on 8 May 1942), to the horror of her parents.) It is unclear whether he thought at the time, as many subsequently suspected, that the child’s father was not Clive Bell, but Duncan Grant, David Garnett’s own lover. To earn a living, Garnett tried running a bookshop with Francis Birrell, and he also started writing seriously. In March 1921 he married Rachel (Ray) Marshall (1891-1940), in the St Pancras Register Office, under a sign that said “Under the Defence of the Realm Act it is forbidden to throw confetti in this building.” Garnett commented “None of us had any confetti, so it was all right” (232).